Last month I had the opportunity to attend the Customer Experience Conference 2015 (CX 2015) run by UX Australia. The conference was about designing customer services, and was coupled with a single-day workshop demonstrating techniques for customer journey mapping. Here are summaries of two presentations that explain what CX consists of and highlight the value of user-centered design methods. Iain Barker – a principal at Meld Studio in Sydney – discussed the right methods to establish a CX vision in an organisation, and the role of qualitative research as a foundation in designing a coherent vision. He identified common challenges when adopting a CX vision, followed by strategies and methods used to overcome these challenges. Iain argued that while most organisations understand the value of creating great customer experiences, many still struggle to define and deliver that vision. Priorities often focus on experiences in specific areas to achieve quick outcomes. Mistakes are common when CX is created in bits, not holistically. Rather than relying on internal expertise, implementing a CX vision should start from outside, mapping customer experience from real customers and bringing that knowledge into the organisation for analysis. According to Ian, adopting CX from experts in the organisation can only result in fractured communication, misinterpretation and inconsistent implementation of CX visions. To achieve a coherent vision, the journey of interaction between stakeholders, staff and customers must be visible, making the intangible tangible. Here, collaboration is key. Working collaboratively helps drive the interaction between customers and staff to clarify the experience they had at every touchpoint. This enables organisations to map out past, current and future experiences thus, setting strategies to apply suitable types of experience that suit the needs of the customer. Collaboration and visibility make the CX vision journey easier and more coherent within an organisation. A transparent process means staff feel ownership and engagement, which helps to achieve the CX vision. The roles of qualitative design research in creating CX visions in organisation. In human-centered design, qualitative study is often used because of its collaborative and participatory nature. Qualitative study can provide insightful information regarding human behaviour, emotion and personality characteristics. Participatory design research suggests creative collaboration generated by engaging activities fostering rich outcomes. However, qualitative research is commonly considered complex and tedious, resulting in many organisations avoiding it. According to Iain, participatory design research is a core foundation for seeking realistic answers, rather than designing based on assumptions. In balancing the numbers yielded by quantitative evaluation, Iain explained how qualitative design research is far more valuable in gaining rich insights, particularly when mapping customer experience. Ethnography or contextual research yields not only rich-quality results, but also opportunities. I must admit that this brought my memory back to interactive projects I was previously involved with, where mapping the user journey was crucial to help determining the structure and flow of how a user would use a product or service. Mapping the customer or user journey commonly appears before creating a wireframe. Additionally it can be used as an evaluation tool to validate design flow, and to see possible experience opportunities that can add value to a product or services. Below is an example of customer journey map for Hello Kitty World in Malaysia by Robbie Robertson presented during the conference. For Iain and his team at Meld Studio, the collaborative nature of participatory design research eliminates the designers’ egos, bringing the customer back into focus. Qualitative research methods minimise potential biases. It ensures design is not being practiced in a vacuum. Leaving every assumption at the door, he suggests that with a well structured approach, relatively small teams can undertake significant qualitative research and contribute meaningful insights about customers, their needs, behaviours and motivations, and identify opportunities to create new CX vision for the entire organisation. Knowing methods only is not enough. 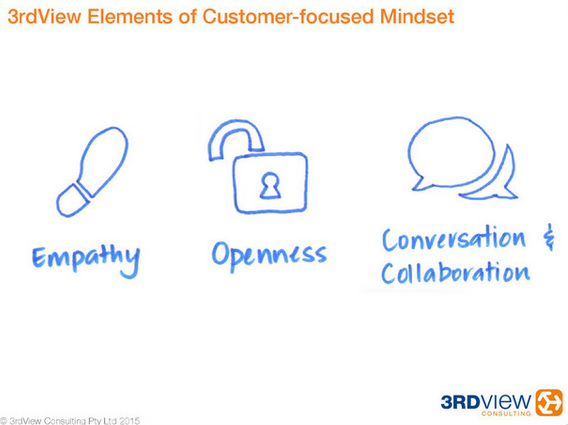 Let’s build a customer experience mindset. 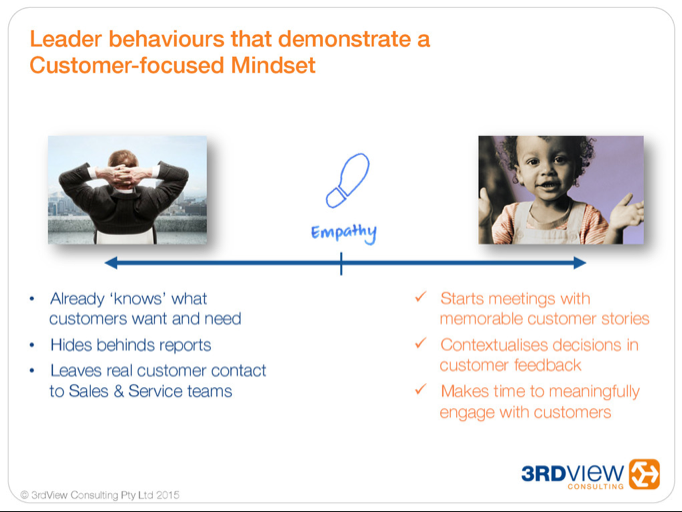 Marie-Claire Grady from customer-focus specialists 3rdView in Brisbane discussed how building mindset is important to shape our behaviour and action in regard to accepting new idea. According to Marie, having a customer-focused mindset is fundamental in improving the customer experience in an organisation. Marie started by telling the story of how her grandma’s business placed customers on top of everything in order to sustain great relationships. Marie described how some organisations build CX capability by learning from trained experts and using books to build a foundation of knowledge. Although this is valuable, relying on what has been written and learned indirectly can be misleading. According to Marie, instead of focusing on a set of knowledge, the key fundamental to build customer experience in an organisation is by building a customer-focused mindset. According to Marie, a focus on mindset is important in any learning program. Marie extended her arguments about ‘mindset over matter’, where by ‘matter’ we mean tools, techniques and process. Marie explained that in any learning program we usually start with strong a desire or interest to know. We then gather the knowledge from experts, which make us well informed about the process involved, and what tools or techniques to use. Whilst being interested and informed is important, it still qualifies as ‘matter’, and many organisations employ this view without setting their mindset. Marie pointed out that relying too much on matter would put the organisation just to be seen as having CX capability rather than having a mindset of customer-focused culture. Here the process of creating a customer-focus is not in balance. In contrast, she described being inspired and influential as key drivers in building mindset. Parallel with this is a mindset definition, which she referred to as a set of beliefs or way of thinking that determine one’s behaviour, outlook and mental attitude. Marie strongly believes that organisational leadership’s behaviour is the front line in the effort to shape and build a customer-focused culture. This behaviour requires belief in the value of working with customers, understanding their world, and designing products and services that solve problems for them. Prioritising mindset over matter is the key here. So, what does ‘mindset’ consist of? Empathy, openness and collaboration relate to each other. Empathy is the ability to recognise and share feelings from another person’s perspective. It is a crucial ingredient for designers respond to the needs and wants of the intended user of a product or service. Empathy has been discussed widely in human-centered design areas, to remind designers that they are designing not for themselves. Having empathy enforces designer to put away their egos. For Marie, empathy in a customer-focused context is about building understanding that each customer is different. Their journeys and goals are not the same. At the conference we were given a task to pair with an audience member sitting beside us. We were asked to envision a perfect birthday we would like to have. After 5 minutes of discussion, we realised that every each of us came out with different ideas of a perfect birthday that tailored to us individually – that each of our needs are different. From this short conversational exercise, we learned that it is important for a customer-focused organisation to frequently ask their staff about the feedback gathered from customers, and to take those questions outside, asking the customers about the types of experience they had or have. Asking what sort of experience the customers want to have is also important, as it brings an opportunity for the organisation to create that experience. Marie stressed that empathy is viable when openness is being applied. Openness is vital to building mindset, and can be achieved by being highly curious, which in-turn leads to building a hypothesis. Hypothesis or assumption can be investigated and validated through information gathered from qualitative research. During the investigation phase, it is important to have an open mind to accept both expected and unexpected information from customers. Furthermore, to improve openness Marie suggested that organisations have frequent conversations with customers, and seek information from multiple sources – both internal and external. This means being open, unafraid and unembarrassed to say ‘I don’t know’ about the real problem, and actively reaching out to come up with solution. By building empathy and creating diverse types of conversation with customers, Marie suggests that we can encourage collaboration, working with customers instead of in isolation. In short, conversation and collaboration encourage good listening behaviour, bringing up empathy by truly listening to other people’s perspective. What can UX design learn from CX? UX and CX have a similar notion and methodology, with human needs and wants being the focal point of the whole process and drive to provide great experience products and services. The focus on delivering great customer experience has been long discussed across other disciplines. For example in my previous research I have looked into business, marketing and service design in relation to cultural heritage and visitor experience. I have learnt how museum meets the need of its diverse visitors through human-centered design method. In an organisation like museums daily interactions happened with various types of visitor, putting pressure on the organisation. In a marketing study done by Neil G. Kotler, it was shown that people come to museum for various reasons, and they seek different types of engaging experiences. Audience, consumer, customer, stakeholders, spectators, participants, users: all fall under the umbrella term of ‘visitors’, and they are all the lifeblood for museums. The term ‘customer’ has emerged in cultural heritage organisations, and is described in terms of the financial contribution people make to museum operations – for example, a person who purchases ticket or buys a cup of coffee at the museum café. The diversity of visitors forces the organisation to divert their goals into embracing this visitor focus and being responsive enough to provide a relevant experience that matches their needs and expectations. Museums also delve into categorising their visitors as ‘actual’ or ‘potential’, to identify their different needs. Their level of experiences were also categorised as ‘pre-visiting’, ‘current’ and ‘post-experience’. Analysing different types of customer is obviously vital for museum organisational growth and sustainability. Designers are always encouraged to participate in the research process to find legitimate design solutions. As a UX practitioner I have found that there are opportunities for designers to leverage our UX skills in creating customer experience capability. 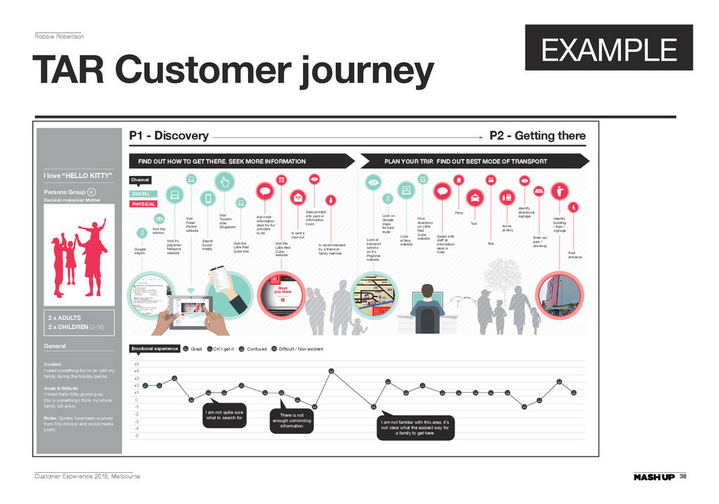 Examples include innovating the design of customer journey, creating tools for user research or customer evaluation and improving organisation’s brand experience. The area of experience provides UX designers with opportunities to get involve or innovate. Overall, the Customer Experience 2015 conference was indeed an inspirational one. I look forward to getting involved in another UX and CX events in the future.